"This project uses ordinary materials in ways that make them seem special. 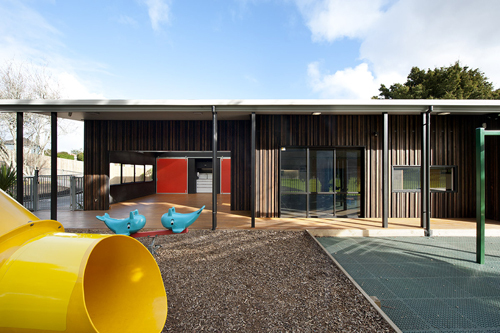 The result is a high quality everyday facility for small children. 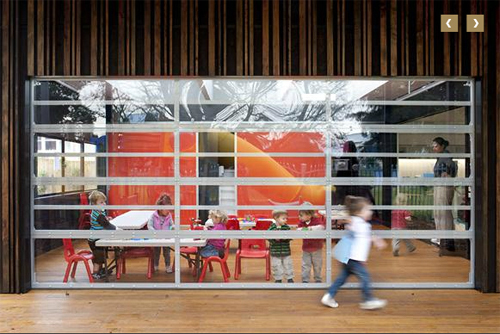 A transparent garage door opens up the main play space and large screens cover the storage walls at the back. 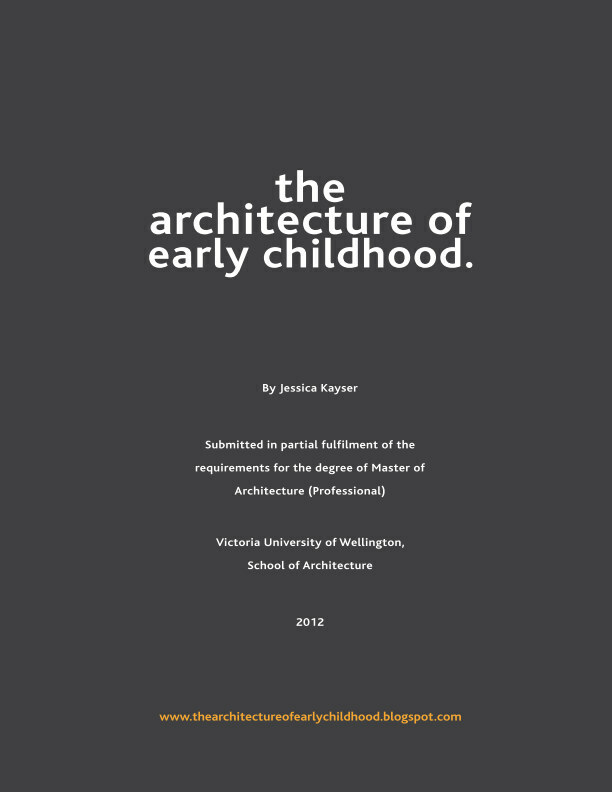 These mechanisms are childproofed and the whole is oriented and designed for the distracted and mobile nature of play. The programme includes Plunket and a playgroup and the social benefits of the conjunction were evident in exchanges between parents. The colours of the architecture are cheerful and rich without being childish in their combinations." 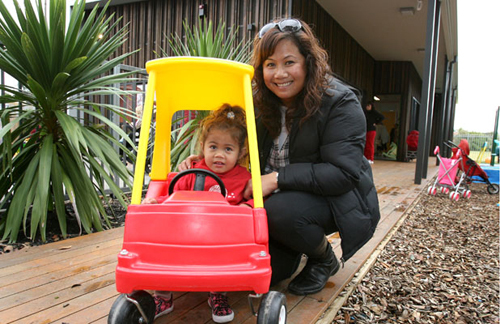 Plunket play group co-ordinator Marietta Ah Chong with her daughter Eva, photo from Stuff. 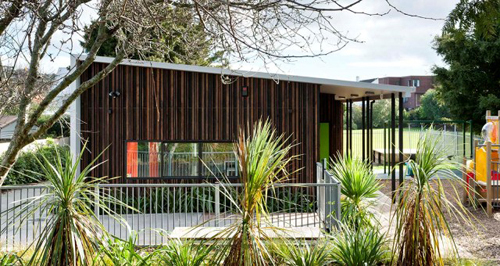 The design for the Sandringham Plunket and Playgroup facility came about when the facility burnt down as a result of arson one Guy Fawkes night. The community met to write a brief for a redesign that would be innovative, flexible, contemporary, cost-effective and efficient. 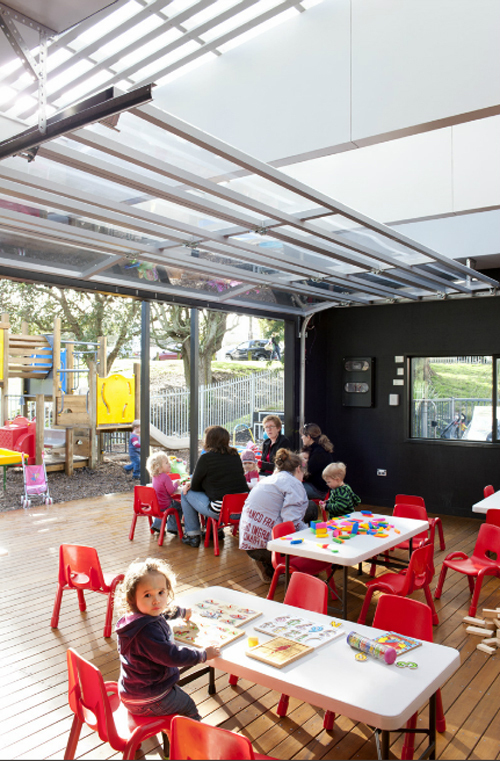 The clients included the owner of the centre - the Auckland City Council, Plunket (as the majority user), and community playgroups as the secondary user. Therefore, the design was to be flexible - allowing for adaptation of facilities for more than one function. The design also had to respond to the Council's CPTED (Crime prevention through environmental design) policy, which led to planting plants around the walls of the facade and fence and the use of "random" overbatten fixed to the ply facade, to deter tagging. ...what a fantastic (and cost effective) idea! The interior features a 'modern' minimalist yet 'homely' décor, and employs the Plunket logo colours, which complement the vinyl and wood finishes.